Ajman: Nathan Foy is England's top batsman, but he is also completely blind. He is the highest scorer for the England blind team, having amassed 1,500 runs. If that is not enough, he has hit two double centuries. He is here to play the blind cricket series against Pakistan, set to commence from April 4. "I have been visually impaired from birth, but as I got older, my sight got worse. It deteriorated further, and by the time I was 16 all that I had was light perception," he said, covering his glasses with his hands against the photographer's flash. "Lights like camera flash really hurt; my eyes are very sensitive to light and that's why I wear dark glasses" he said politely. Foy falls under the B1 category players, who are totally blind, but have performed on par with B2 (partially blind with upto four metres vision) and B3 (partially sighted with vision upto six metres). 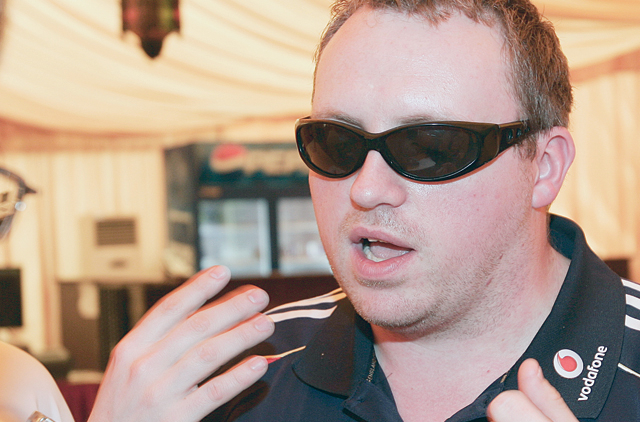 "I have been playing blind cricket since 2000 and from 2001 I have been representing England. I have hit two double centuries. "In the 2002 Blind World Cup, I hit 232 runs against Pakistan in a group match in Chennai [India] and helped my country beat them. Unfortunately, in the semifinals, Pakistan beat us to take revenge," he said. "In 2008, I scored another double century against Australia and now I need a third. Hopefully, I will get it in Sharjah," he said confidently. How did he get interested in cricket? "I always loved cricket but I never thought of playing it. I was good in athletics and used to participate in long jump and triple jump for the visually impaired; but I got injured when I was attempting to qualify for the Para Olympics in 2000. "In the days of my recovery, Hendriks Sonpaul, who has been playing blind cricket since 1998, suggested that I play blind cricket. That's how I got interested," Foy, who was trained under many first class cricketers, said. Foy is aware of every detail of the runs he has scored. "I am fortunate we have good scorers and good officials for blind cricket. "I have all my scorecards in my computer. I have scored ten centuries and hit up 1,500 runs. "Mohammad Ashraf Bhatti of Pakistan may be the only batsman with more runs than me. We have some young players in the team now and very soon they will soon catch up with me." Are people who are visually challenged underestimated? Will you be watching the match? Tell us.